For Diploma Trainee : DIPLOMA in Electrical/Electronics & Communication Engineering from recognized Technical board/institute with 70% marks. For Jr. Technician Trainee : ITI (Electrical) pass in Electrician Trade from recognized Technical Board/ Institute. For Assistant : B.Com with 1st Division for General/OBC(NCL)/ST candidates and pass marks for SC/PwD(HH-PD) candidates from a recognized University. Additional qualification of M.Com shall be desirable. Selection Process : Selection will be made on through Written Test /Trade Test/Computer Skill Test. APPLICATION FEE : Candidates have to pay Rs.360/- for DIPLOMA Trainee & Rs.260/- for Assistant/Jr Technician Trainee through Bank Challan. SC/ST/PWD/Ex-Servicemen Candidates are exempted from the payment of application fee. 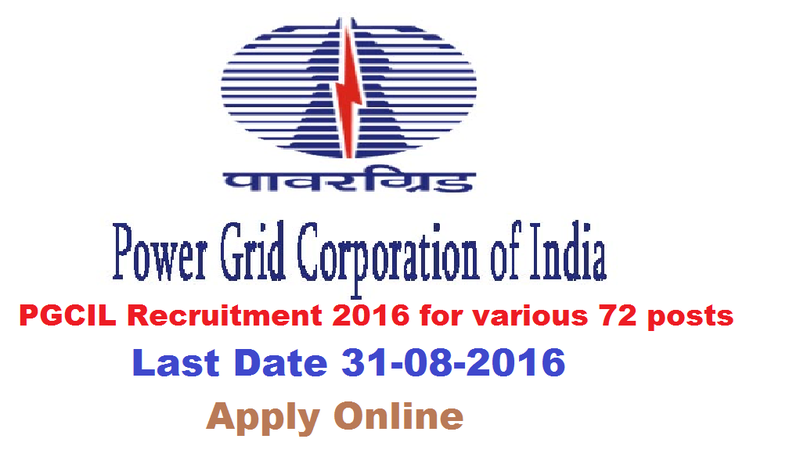 How to Apply PGCIL Vacancy : Interested Candidates may apply Online through the website www.powergridindia.com from 10.08.2016 to 31.08.2016.